Say hello to the new tyrannosaurid in town: Alioramus altai, the new sister species of A. remotus. Steve Brusatte discussed, with enthusiasm*, this critter at SVP, and now he's published for all to see. I'm not going to link to the article, because you probably can't get it, because PNAS is too good for open-access. Screw you, PNAS! If anyone here wants a copy of the paper, I am all too happy to email it to them. Just leave your email address in the comments or email me, personally. Anyway, this is an exciting find because A. remotus is known from very scrappy remains, and this new species allows us to figure out where the genus sits in the Tyrannosauroidea--turns out it's not basal at all, but between Albertosaurines and Daspletosaurus + (Tyrannosaurus + Tarbosaurus), making it a member of the exclusive Tyrannosaurini. Steve made a big deal at SVP, at Archosaur Musings, and in the paper about how Alioramus deviates from the traditional tyrannosaur body plan, but I don't really see it. It looks like an albertosaurine to me. As for the picture, it's just a little something I whipped up during Tobi (one of my meds) last night. I'm not at all happy with the snout texturing, but...eh. Too late to change it now, it's just meant to be a quick sketch anyway. *Enthusiasm here being the key word. Steve gave two talks (that I know of) at SVP, and he seemed genuinely excited about both. This is at complete odds with about 95% of the other speakers, who sounded like they'd either been up all night or just weren't that enthusatic about their talk in the first place. Honestly, there were times where I suspected the latter (crown length and denticle variation in Coelophysis? Excuse me while I grab a power nap). The only speaker who rose to challenge Steve's bruhaha was a fellow whose name I cannot recall, but he gave a rousing talk about the M. caudofemoralis muscle in Tyrannosaurus with great zeal. His presentation included the phrase "junk in the trunk," so he may have to win some kind of award for that one. Aside from being entertaining, the talk was informative as well, especially for paleo-artists like moi. To be fair to PNAS, they do have open access after one year. And it's relatively "cheap" to buy their articles before that ($10, vs. $32 or $37 that other journal publishers charge). Not that $10 is cheap, but it's better than what it could be. . .
Do you mind send me a copy of the article. It's nice for Steve that he got to give two talks. It's nice for Jason Head that he also got to give two talks. And yet, and yet ... Will you think too badly of those of us who were allocated zero talks if we can't quite share in their rejoicing? And by the way, if I ever DO get an SVP talk (fourth time's the charm, right?) I'll show you some ENTHUSIASM! Thanks for your kind words, Zach. And I love seeing your version of Alioramus in the flesh. Very cool. There are several ways in which this is the case. First, its skull is extremely long and low, much more than any tyrannosaurid (including albertosaurines). Its skull bones are more gracile than other tyrannosaurids, and its teeth thinner and weaker. It lacks all trace of a robust brow above the eye and the deeply interlocking dentary symphysis. And, when compared to similarly aged Albertosaurus and Gorgosaurus, it is quite a bit smaller and lighter (we talk about this in the supp info of the paper). Ditto for comparisons with tyrannosaurids: it is half the mass of a similarly-aged Tyrannosaurus or Tarbosaurus. To me, this is reason enough to describe it as deviating from the classic tyrannosaurid body plan. Thanks for explaining that, Steve. I'm just so married to the idea of albertosaurines being "gracile" tyrannosaurids that I have a hard to figuring out what a "more gracile" tyrannosaurid means. But that certainly clears it up, and now I see what you mean. I just recently got through the Supp. Info, too, and that helped. When I think about it, if you add in the possibility of Nanotyrannus being a second genus, it seems like there were a lot of tyrannosaurine tyrannosaurs that were quite gracile. Even if Nanotyrannus is just a juvie T-rex, it still shows that lithe body forms were common amongst the "bulkier half" of the Tyrannosauridae. I have heard that albertosaurines just about disappear when one gets into the Maastrictian. Maybe the Tyrannosaurines were diversifying into the niches opened by their kin. I agree completely, Zach. Would be wonderful if the holotype of A. remotus was better described. It's a great shame that the sole paper on the critter is a short, sparingly illustrated, Russian tome. There have been many problems with folks getting access to that specimen as well, so I wouldn't hold my breath waiting for a proper description, sad to say. As for Nanotyrannus, I am firmly in the camp that considers this "genus" to be a juvenile Tyrannosaurus. I think Thomas Carr's various papers have nailed this home. Working on Alioramus has opened my eyes to the possibility of smaller, more gracile tyrannosaurids. But, with that being said, Nanotyrannus is a different case all together. 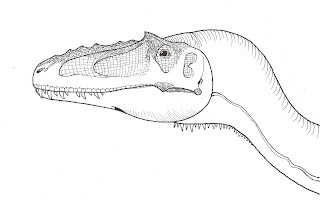 Alioramus can be diagnosed relative to Tarbosaurus by a laundry list of autapomorphies, most of which do not vary ontogenetically in other tyrannosaurids. We can, in many cases, directly compare obvious Tarbosaurus individuals of the same size with Alioramus (we do this in our supplementary information). The Cleveland Nanotyrannus skull, on the other hand, has perhaps one or two unusual features that are not seen in other tyrannosaurids. And its size and features fit perfectly in the middle of Carr's Tyrannosaurus growth sequence. And, there are no obvious Tyrannosaurus individuals of the same general size that differ from the Cleveland skull. Tyrannosaurus is very common in the Hell Creek, so why none of these? And, where are the Nanotyrannus adults? In a unit as well sampled as the Hell Creek, where we have 30+ Tyrannosaurus individuals, this is quite a problem. In short, there were at least two tyrannosaurids in the Maastrichtian of Asia. Best we know, there was only one in the Maastrichtian of western North America.